Every other Tuesday Apple releases a whole bunch of new betas, and today is one of those days. We already told you about the new, fourth beta release of iOS 9 and Apple has now also pushed new releases of OS X 10.11 El Capitan and watchOS 2 out to developers. 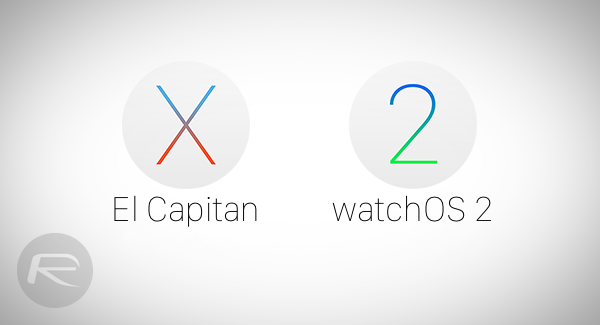 Accessible via either the Developer Portal or the App Store if you are installing El Capitan, the new betas are available to download right now. Carrying the beta releases of OS X 10.11 El Capitan into its fourth beta release, the new update carries with it a build number of 15A226f, and those who don’t already have an earlier version installed will be able to get a download code from the Apple Developer Portal. Once that code has been redeemed in the Mac App Store, you’re well on your way to getting your very own build of El Capitan on your Mac. As for the Apple Watch, watchOS 2 is now available to download in its beta 4 guise, and with some of beta 3’s bigger problems apparently fixed in this release, those running an older version of the beta will want to update sooner rather than later. Amongst the fixes implemented as part of watchOS 2 beta 4, users can look forward to Apple Pay once again being functional Apple ID and associated Messages issues being a thing of the past and other smaller improvements. As reports start to roll in from people brave enough to install a beta release on their watch, it appears that one of the undocumented additions and one that will be popular amongst many is the change of color for some of the default complications – namely the Activity one. Previously gray and now fully colored to represent the Activity rings, the improved complication is much more readable, especially amongst busy watch faces. With custom complications also on the way as part of watchOS 2, all eyes will be on watch faces from here on in to see what else gets changed or added. At this point it’s worth reminding everyone that these betas are still fairly early in the process, and bugs will still be apparent. If you do install either OS X 10.11 El Capitan or watchOS 2, just keep in mind the fact that some things may not work and, importantly, it’s not the developers of apps that are to blame. Best to leave the betas to the professionals for now.